[When I lived in Amarillo, Texas, from 1966-1990, I gazed upon the landscapes of the Panhandle-Plains and saw distances and life in those distances. Not barren, not unlivable, but inhabited. Sandhills Crane, burrowing owls, sagebrush, mesquite, cool waters of the Prairie Dog Fork of the Red River, geese, Mallards, mule deer, white-tailed deer and the Barbary Sheep of the Palo Duro Canyon. I hiked into the edges of vast ranches and found campsites of cowboys and Kiowa tribes, they not-knowing, the owners that I was even there, lightly I trod. In the midst of all this wandering, I taught at Amarillo College and I impelled my students in anthropology to sketch corn-grinding sites in the canyons for practice and awe. Somewhere along the way of field trips and hikes, I came across Aldo Leopold’s A Sand County Almanac. He died fighting a prairie fire. 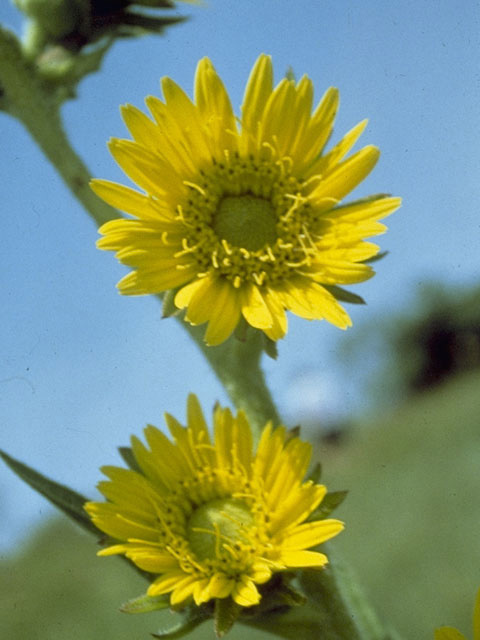 Here is an excerpt about the Silphium of the Aster family. It is more than a plant cut under the progress of road. It is the canary in a cage in a mine, deep into the earth. 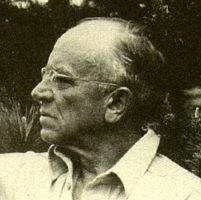 Leopold, Aldo: A Sand County Almanac, and Sketches Here and There , 1948, Oxford University Press, New York, 1987, pp. 44-46. All photographs of the plants, courtesy of Lady Bird Johnson Center for Plants in Texas. My life has been defined by animals. All sorts of animals: chickens, dogs, cats, horses, cattle, birds, wild and domesticated beings. For whatever reason, I preferred to stay home as a child while my mother and grandmother worked and when I was older and my mother married J. W., I liked the fact that he had land in Mills County filled with cattle, raccoons, squirrels and wild, tall, native grass that I later learned was bluestem. I was a latch-key kid. 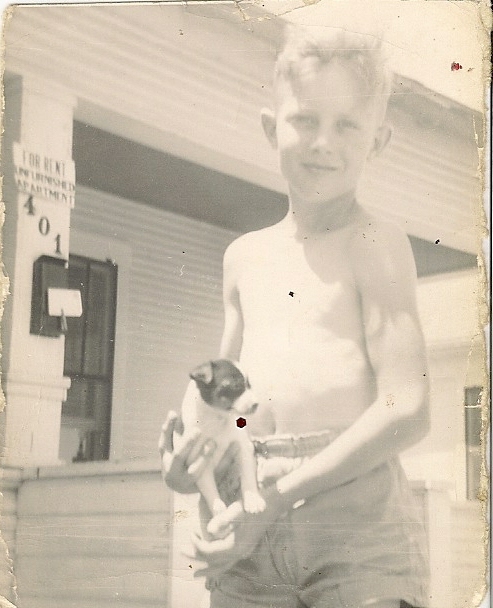 And when I sped home on my Hawthorne, Montgomery-Ward bicycle, the first thing I did was play with the dog. The dog you see in the picture is Spot and he was the second dog I ever owned. He did not live long, for distemper took his life. Before him, there as a chow-mix of a dog named Toy that mother had to relocate because he ate the neighbor’s chickens. I loved that Toy and when he was picked up by a farmer that lived in Bangs, Texas, one world came to an end and I lost my innocence, not in the back seat of a Ford, but in the driveway of my home as Toy went away. To this day, I can remember his fur and his dark, black tongue. Many events force growth and sadden our days. The loss of a loved one, four-legged or not, wounds us and we stagger into days and nights hating the loss and finding ways to forget it or ease the heart from the tear. Many events bring growth and brighten the day. The face of a loved one upon rising in the morning, the nickering of horses in the barn and the wagging of that tail. At the end of this post On the left sidebar of the blog home page are photos of cats, dogs and horses that surround Brenda and me. All of the cats are gone now, from accident or predators. I miss each of those kitties: Fenster walked with me to the far fields like a dog, Bubbles talked to me on the road down to the barn and Painters never strayed from my side while I fed and tended the horses. Painters would lie down in the middle of the corral and the horses would walk around him. Lottie is a schnauzer and was my mother’s pet. I brought Lottie to Mingus and she has run through every room in the house slamming her toys for attention and play. Yeller is like Toy, my first dog, the chow-mix. I first saw Yeller across the county road, staying on the Nowack place, our neighbor to the north. Yeller loved children, but the Nowacks had several dogs already and Yeller had come from some other family or was abandoned in the country by a cold-hearted person. One day Steve Nowack tried to shoo Yeller away. Yeller crept off the property and went down the road, just out of sight of the children, and stopped. Yeller turned around and sat on his haunches and looked over the grass towards the children, wagging his tail and smiling, wanting to go back and let the smaller children ride him. I had already begun to like the old boy, but that was it: Yeller obeying to go off as instructed, but not far enough to lose sight of children. I would not let another minute go by with him unattended by a human companion. I called him to our yard. As he saw me engaging him and then petting him, Yeller ran around in circles, merrily and merrily he went. Soon, we took Yeller to the vet and had him brought to pristine health and today, tonight as I write this post, he sits on the floor beside me. I walk him and Lottie three times a day. He is always on leash. I cannot dis-attach myself, nor do I want to, from the kingdom of animals. There are only nine Monarch butterflies in this roost, but it is a grouping that I photographed as the sun set this evening. Five years ago, Brenda was walking Yeller, our Aussie-Lab mix, and as she came back to the house, Yeller kept looking up in the sky. Brenda, puzzled, looked up and hundreds of Monarch butterflies filled the space above our house. They probably roosted in the grove, but I was unaware of their habit patterns. We have not seen such a sight again. Over the past two weeks, I have noticed Monarchs floating lazily across the interstate between Mingus and Abilene. Not many. I’ve counted only, at the most, four monarchs on the way back to my home, a trip of 87.2 miles. 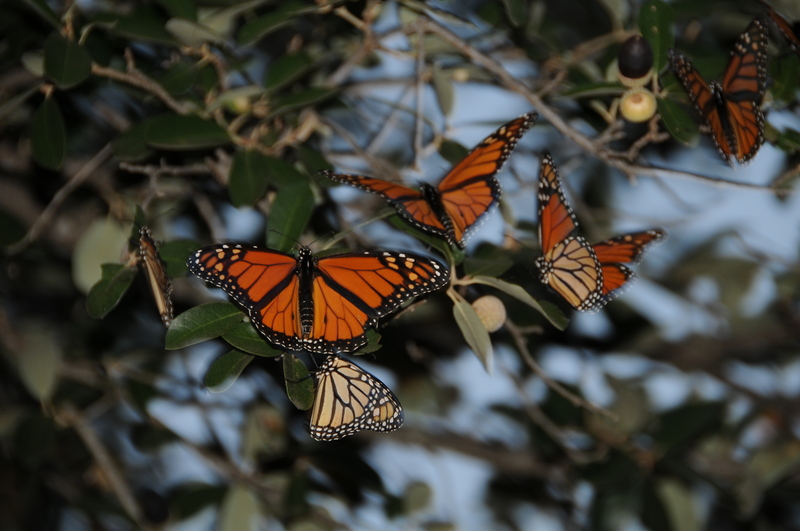 This evening I took these photographs of the Monarchs that are roosting in our live-oak trees in front of the house. There are nine Monarchs. (One Monarch is nearby, but out of the photo frame.) They have settled in for the night. October is for turning leaves and the Monarch. It is a small grouping, but a grouping nonetheless. They seem so fragile, but I have read they migrate for hundreds of miles without injury. Above our ranch, there also soars Sandhills Crane when the frigid temperatures force them southward. I shall photograph the Sandhills when they pass this season. I first hear them, then I see them. With the Monarch, first I see them and then I gaze on them intently, sensing a unity they have as a cluster, roosting together like birds, like birds. Our house is on a knoll, called Poprock Hill, and in chasing the Monarchs before I saw them roosting, I took several pictures of Monarchs that were out of focus and sailing southward. Then, Brenda, said, “Look in the front yard!” I was so anxious to get pictures I couldn’t focus the camera. But, the Monarchs were patient with me and opened their wings for some reason. I got the pictures without falling off the terraces. 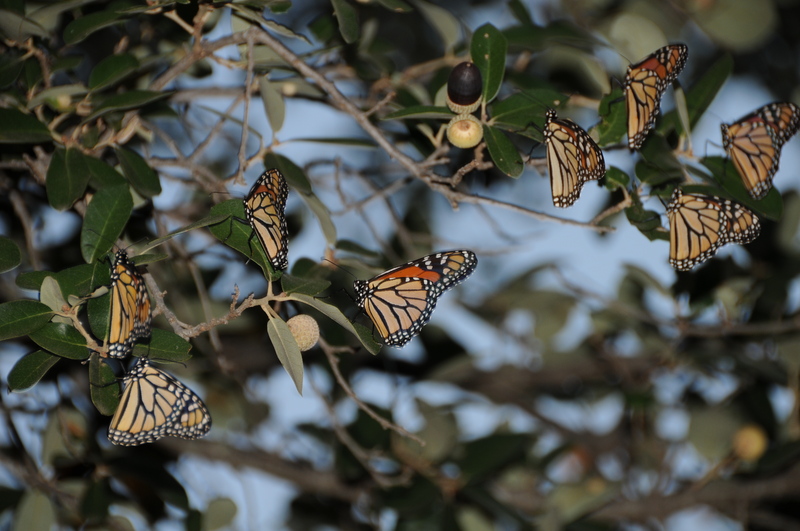 Other Monarchs are floating above our tree line and probably will roost close by, but these guys are in the big live oak tree in front of our porch. Update, October 14, 2010. As I left this morning to go down to the barn to feed and then commute to Abilene, I went back out to the Monarch roost. I shined a flashlight on the roost and the Monarchs were still resting. The temperature was between 38 deg. F. and 45 deg. F. about the area — from here to the interstate, about four miles north. I’ve spotted no Monarchs this afternoon. I watched closely until dark. What is Milagro at Los Luceros? In May of 2009, Governor Bill Richardson and Robert Redford announced a new, unique collaboration for New Mexico’s Native American and Hispanic filmmakers with the working title of ʺSundance in New Mexico.ʺ The collaboration has been officially renamed “Milagro at Los Luceros” in reference to The Milagro Beanfield War, the 1988 film directed by Mr. Redford, shot on location in Truchas, New Mexico, and based on the John Nichols novel of the same name. Named to the National Registry of Historic Places in 1983, Los Luceros is a hacienda (ranch complex) lying northeast of the town of Alcalde, New Mexico, just north of Española, on the Rio Grande. 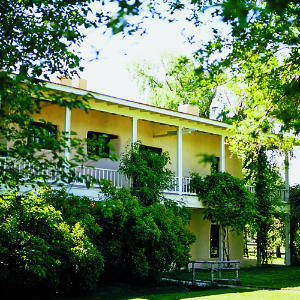 The New Mexico Department of Cultural Affairs (DCA) purchased and operates the 148‐acre Historic Los Luceros property and is preserving its historic nature and integrity for the purpose of cultural, artistic, environmental, and educational activities, events and outreach. What is the mission of Milagro at Los Luceros? Los Luceros has a long history, dating back to pueblo occupation in prehistory. Mary Cabot Wheelwright and family lived on the site for many years. She and other scholars discoursed with Hastiin Klah at Los Luceros whose sandpainting tapestry is displayed in the Wheelwright Museum of the American Indian, Santa Fe. I visited the museum several times during the 1970s and 1980s when Klah’s tapestry dominated the public display collection. I have several postcards of his sandpaintings and his biography in my personal collection. September 2009 SAR Field Trip to Historic Los Luceros. April 2009 Field Trip of Chilis and Sherds to Los Luceros, Friends of Archeology. 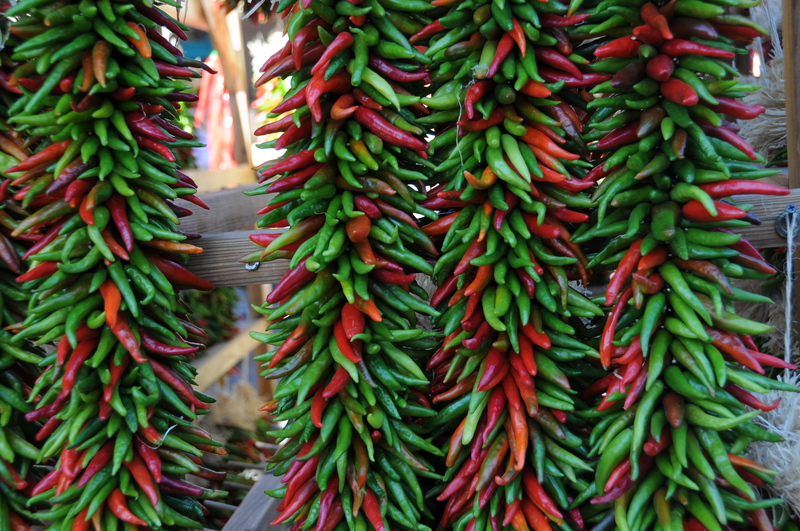 Pepper ristras adorn roadside markets in New Mexico before the Fall equinox. Bundles of harvest, early-arriving gifts from Christmas future, ristras symbolize the product of good growth in the high desert country, the earth’s abundance with green and red eruptions. Unlike other harvest food, the red and green pepper wreaths are hung for celebration as well as convenient spice for stew, meat and vegetables. When I see ristras, I see New Mexico, the American Southwest and callused hands nurturing soil and weaving garlands, farmers sitting under arbors beside the highway in a hundred places. Entering winter’s cold after equinox, I know the fruit of the ristra will warm me, warm us, into the day and night on both sides of Christmas with sight and taste for the holiday, table and heart. I am not getting any kickback from this link The Real Southwest Hatch Chile Pepper Ristras, but it was too good to let pass with this post. There are probably a number of other links and articles on the web. I will try to list more ristra links under this post. For the last two mornings as I have walked the dogs and tended horses, the temperatures have been down into the lower 50s, upper 40s. Such a relief to have Fall come. I slip into my old, red coat to enjoy the cool, late-night outdoors before dawn. My Aussie shepherd, Yeller, and schnauzer, Lottie, linger at the gate. The quarter-size moon in the eastern sky holds water like a cup. I hear coyotes. Yeller stands still, facing the coyote chorus. The pack goes quiet and we return to the house, enter the kitchen and begin the day.